Join the discussion on our forums! Come discuss Meat Wagon over in our dedicated Meat Wagon discussion topic. "Deathrattle: Recruit a minion with less attack than this minion." Spiritsinger Umbra into Meat Wagon. meat triggers. summoning Devilsaur Egg and then triggering egg to summon a 5/5. or get a validated doomsayer. Actually did both combos in one game in this week's tavern brawl. This whole time I thought it said draw not summon . . . I guess the dream would be; Spiritsinger Umbra into Meat Wagon into Devilsaur Egg . 2 Cards, 8 Mana, Summon 4 Minions, total 9/16 with two death rattle effects still up, if they cant remove Spiritsinger Umbra that's a scary board. adding Play Dead for 9 mana would be nice. play it on Meat Wagon to summon another egg and a 5/5 (or 0/7 guy) if you have Corpse Raiser active on egg, you can cast on egg for yet another set. 0-1 mana: Nothing playable, except maybe dragon egg in wild. 2 mana: Public Defender, Doomsayer, Lightwell, Primalfin Totem, and Nerubian Egg, seem like the most worthwhile. The doomsayer play could definitely be good, but otherwise, nothing too crazy. 3 mana: Alarm-o-Bot (Memes incoming), but probably nothing special. Street Trickster and Devilsaur Egg, along with Mana Tide Totem. Rarely run cards, but not exactly bad. So what does this list tell us? Almost all of these cards are rare, except for doomsayer, which means that in a deck that runs 2 copies of one, at least your first meat wagon is very likely to pull exactly the card you wanted, and you don't have to worry about variance, because why would you run the others? As it stands, a priest deck running all of the 4+ cards I mentioned could make a serious board presence as a reasonable price, especially since they all have significant health, so they could get excellent value from Inner Fire, especially with Divine Spirit. (Credit where it's due, I wasn't even thinking about it until someone else mentioned Lightspawn. Is it worth it to buff it? Theoretically, anyone who can buff this can make some good value out of it, but is the value good enough? Let's look at someone who's got an obvious synergy: Handbuff paladin. Is this good there? Honestly? It's not fantastic. Looking through all minions with 2 or less attack, you run some of those in handbuff paladin, but the ones you run are almost entirely junk when pulled from your deck with no buffs. Unless, of course, you run a C'thun paladin, like I have, get 6/6 of total buffs on it, (Probably using Don Han'Cho), and then highroll out your (Technically a 6/6 in deck) C'thun, who then turns into a 22/22, or somesuch. But honestly, that seems unlikely. Where would you run this? My bet is on an inner fire priest, which is the same conclusion I came to in the above. Inner fire (And/or crazed alchemist, confuse, etc.) let's you turn a pull of a weak, but tanky minion, into a big, beefy murderer who can go face and can end the game in one hit. Lightspawn, of course, get some Lyra action for that, summoning stones. I can see, if not a meta, at least a crazy-fun deck to demolish unsuspecting enemies with, when it goes off. Bonus! Put this in a Hobgoblin deck, maybe with your only other 2 attack minion being the other Hobgoblin, and watch your opponent concede when they can't kill the second one. Standout Exceptions: with a +1 Attack buff, you've got some good options. Take, for instance the lurkers, and the surprise powerhouse we find in some kind of control-y warlock, where dreadsteed, tar lurker, and voidwalker all set up for beautiful pulls with just a little buff. Also worthy of mention may be our old, forgotten friend the Junkbot! Whirling blades and the pull may or may not mean an effective 3/7 pull, which would be very good. Cool effect, bad body. Might be broken one day, will have to see more cards and sets. Guys, Inner Fire and Grimy Goons cards make this a decent card for card draw, it will see play in a few decks here and there, maybe even as a staple, but probs not. Blood-Queen Lana'thel synergy incoming, (with a +1/+1 buff :/) I'm calling that this will fit into a Discolock somehow. Devilsaur Egg, Doomsayer, Validated Doomsayer, Lightspawn, Nat Pagle, Lorewalker Cho (a so, so but still possible. ), Primalfin Totem, Mana Tide Totem, Summoning Portal, for free!!! calling this card bad is insane! 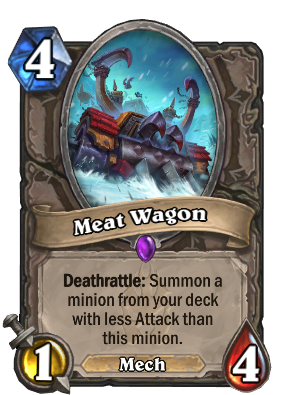 hmm maybe... Meat Wagon + Validated Doomsayer for 4 mana is efficient. other then that a) it does make you go thru the deck witch is good for jade and miracle. and b) it pulls exactly a specific card, maybe a doomsayer that you will need to handle the second you kill Meat Wagon witch can change a few things. and maybe you right and its thresh, we will wait and see.